When you’re a single mom, juggling your children’s activities can seem overwhelming. In fact, I find myself not letting my oldest sign up for all the sports he’d like—especially not club teams—as I can’t always manage to go to all the games or pick him up late at night. It’s getting a bit easier to ask other moms to drive him home now that I’ve officially been in California four years. But in the early days, when I was first separated and taking care of a baby and a 7-year-old, it was tremendously hard to ask strangers to take my older son home from a game. Some coaches were supportive, but others not. I guess it’s hard to imagine not having another parent or family nearby to help. But that’s the way it is for some of us, and we don’t want to punish our older children and not let them participate in the group sports that they used to, just because of a divorce or a baby sibling who needs to nap or gets sick often. Juggling activities and sports really can seem overwhelming sometimes, and I’m so thankful that it’s getting easier. When I wrote this post, I was clearly still in the trenches. Last year, I couldn’t always cheer my oldest on at the soccer matches, for instance, as his baby brother was tantruming, or running wild and I had to monitor him. Then, occasionally, I’d have to leave mid-way through since the game times always happened at naptime. With all the other kids’ dads screaming from the sidelines, I really wanted to make sure that at least one parent was always present to cheer my son on—but it doesn’t always work that way when you’re a single parent. I know some divorced parents co-parent well, but for me, my ex lives abroad, so he’s just not here often. It was a depressing time for my oldest. I could never get him excited on game day and yet, he loves soccer. The minute you find out who your child’s coach is, email him and explain your situation—especially if you are juggling activities for more than one child solo. Let him/her know that you’ll make sure your child doesn’t miss any games (barring illness) but that you may need help occasionally with a lift home if your other child is playing a game elsewhere or another child is sick. Would he mind? Suggest to the coach that all parents bring their own snack and water. And if he still wants each parent to volunteer to do a group snack one week, don’t feel obligated, just say you’ll bring your child’s snack and water each week. Carrying all the gear and another child up to the field and a tray of muffins is ridiculous. If you can’t get out of it, just bring a box of granola bars. Get to know the parents on the team and exchange cell phone numbers as soon as possible. That way, if an emergency happens with another child, you can call a parent on the team to help. Do some networking to find a great coach. Sometimes it just isn’t possible to sign up your child with a particular coach—like with AYSO, you find out who your coach is a few weeks before the season starts. But if you can, network with parents at your child’s school and find a supportive, enthusiastic coach who can help mentor your child. It’s especially important to find good role models for your kids when you’re going through a divorce. Don’t do multiple sports each season. There is only one of you. Tell your children to pick one sport per season, so you’re not going out of your mind trying to make multiple games each weekend. Don’t pressure your child too much about performance. This likely goes without saying, but make sure your son or daughter know that the game is about having fun. Sit him or her down at the beginning of the season and explain that you may not be able to stay for the entire game every time because of the other games of brothers and sisters or due to a baby brother’s or sister’s needs, but that you’re happy that they get to play, do their best and have FUN. Show gratitude at the end of the season. This is especially important if a coach and other parents have been particularly helpful. Hire a sitter for the last game and go solo, bringing goodies for everyone if you can. It lets your child on the field, and the team, know how much you appreciate them. 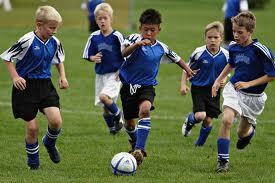 This entry was posted in Parenting and tagged American Youth Soccer Organization, Are kids over-scheduled?, California, Child, Granola, Juggling, juggling activities and sports, Parent, Single-parent, soccer game etiquette for divorced parents, soccer mom, Sport, youth sports and the single mom. Bookmark the permalink.